Sophie is bonkers for colour! 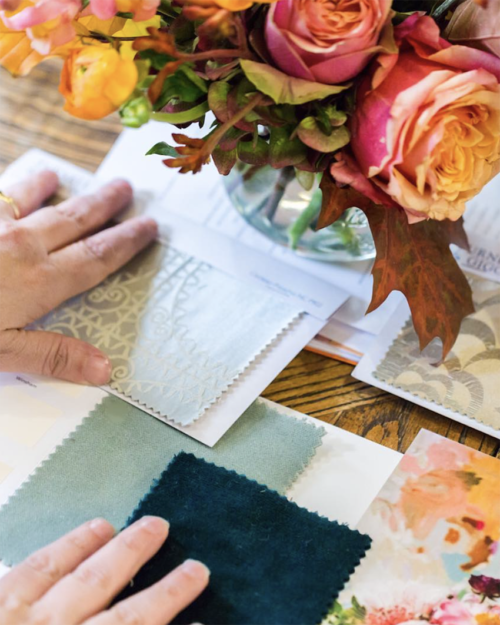 For over 20 years she has been lucky enough to eat-sleep-breath all things interior; working across magazines, TV and for some of the top retailers in the country. Her own home is a ‘random’ collection of things she loves, which, through experience, she has managed to make “hang together”. 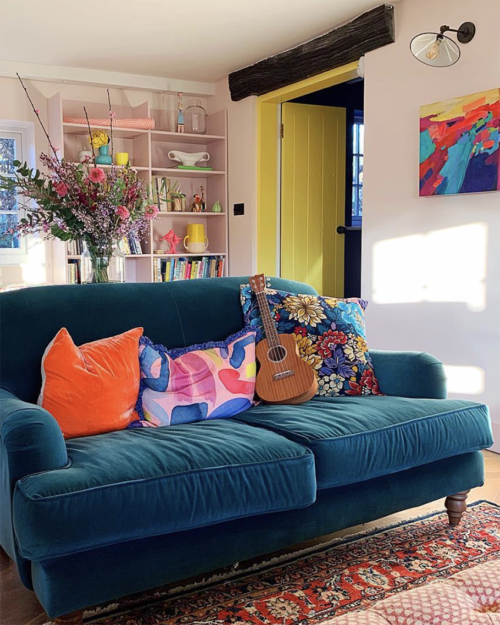 Her mission is to provide others with the confidence and inspiration to have a vibrant, fascinating and original home which reflects their personality and interests. Will Sophie convince you to be bolder with your design choices? I’m an interior designer but first of all, not in the traditional sense. I don’t do up rich peoples houses! My background is as a stylist for magazines and photo shoots, producing room schemes and features to empower people to do it themselves at home. I also run workshops and courses to help people tap into their own style and create audacious interiors. My mantra is ‘ban the beige’. Having left a career in magazines I now design for TV shows like BBC one’s DIYSOS and appear as a judge of The Great Interior Design Challenge. Have you always been interested in interiors? Yes! One of my most formative memories is aged seven, my Mum allowed me to choose the colour scheme for my bedroom. I was enraptured by the wallpaper books. This was the eighties after all, so I went for multicoloured graph paper wallpaper, a rainbow paper border and then rainbow matching bed linen and curtains. 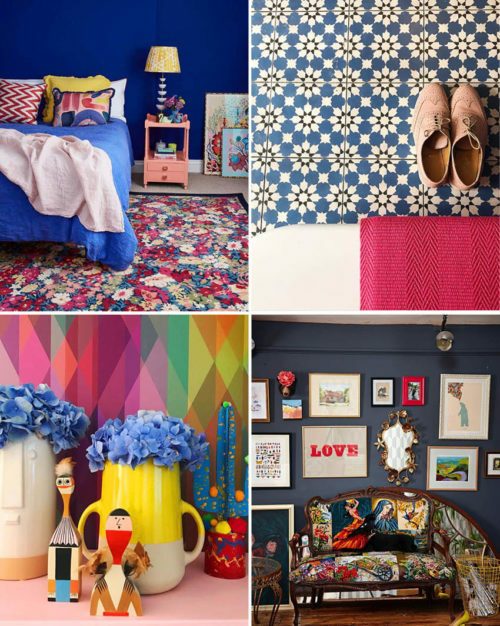 Where did your love of colour and pattern come from? I think children have a great confidence with colour that over time gets beaten out of us. As we get older, life gets more serious. We worry more about ‘what people think’ and about ‘getting it wrong’, and before you know it you’ve painted your whole house 50 shades of grey. As you can see I discovered my passion for colour at a young age and then was lucky that my parents nurtured it. I was always redecorating and switching my room around. Describe your home, what changes have you made? I live in a Sussex tile hung farm house in the countryside surrounded by woodland, with my husband Tom who is a builder, our seven year old son Arthur and mini bull terrier Lucy. We bought the house three years ago and it has gone under major improvement in that time. Money drains have been putting in a new water main, a damp proof course throughout the ground floor, replacing the kitchen and landscaping the drive. Only recently have we finally got around to doing the pretty bits. Colourful and eclectic! I love how colour can completely transform a place. Our house was wall-to-wall beige and magnolia when we moved in. I had to live with it like that for two years before we could throw any paint up and it really made me feel sad. I prefer a colour soaked, pattern clashing, feathered nest approach to decorating. I like a home to feel lived in and tell a story of the people who live there. Where do you find your interior inspiration? Everywhere! I’m lucky that I work in the industry so I’m in touch with design inspiration every day. Be it a trade show I attended to spot new trends or scrolling past all the amazing images in my Instagram feed, which I attend to daily. However, I also get inspiration from things out of context too. Fashion can be a real inspiration, I’m always checking out window displays. I love the fabric collections and one of my favourite things to do is loose a couple of hours in Liberties in London. I might also get inspiration from films or theatre I’ve seen. You just need to walk around with your eyes open! Who are your design icons? I look to any designer who is using colour and pattern in an interesting way. I look to Edward Hall, Ben Pentreath, Kit Kemp and Anna Spiro. I also love the work of Instagrammers Comeintothewoods, the_idle_hands and maxmademedoit. The hallway! It’s this incredible electric blue which is my current all time favourite colour crush. It really sets the tone for the rest of the house and all the rooms that come off it. And it might just be the only room that’s finished too! Tell us why you chose a Roger Oates Design runner? Was the New Hadley Bright Rose an immediate choice or did you deliberate between a few designs? 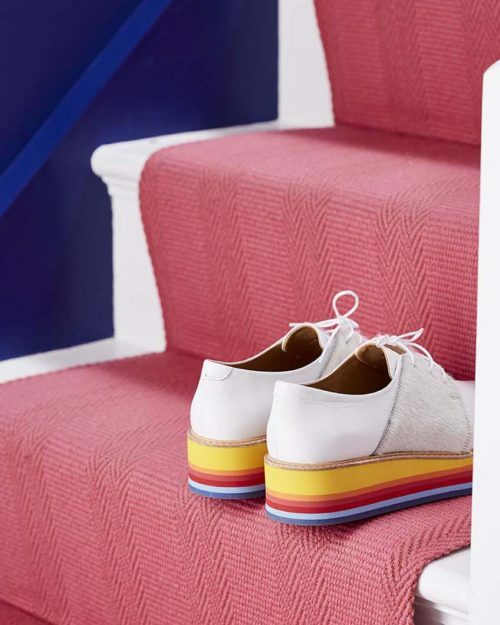 I’ve loved Roger Oates as a brand for years and have used them in lots of projects and shoots. They were my go-to when it came to choosing my runner, as I just love the colour offerings, and knew I’d find something that suited. I was inspired by fashion stylist Erica Davies house, she has the New Hadley Lime, and it looks amazing! I chose the hallway colour first which is a very rich blue colour and as I love to make a loud contrast with my interiors, I thought the Bright Rose or Mandarin would work well. I also asked for a sample of the Figue too, in case I chickened out. In the end I went for the Bright Rose as it just made my heart swell. Always listen to your gut when decorating, it’ll never let you down. What is the best compliment you have had about your runner? That my husband loves it! He said at the beginning of our renovation that he would be happy to go with most things I suggested in terms of design, but resolutely told me NO PINK. So to have won him over with this really bright shade of pink is a real achievement. What advice would you give to someone looking to update their hallway? Don’t be boring. 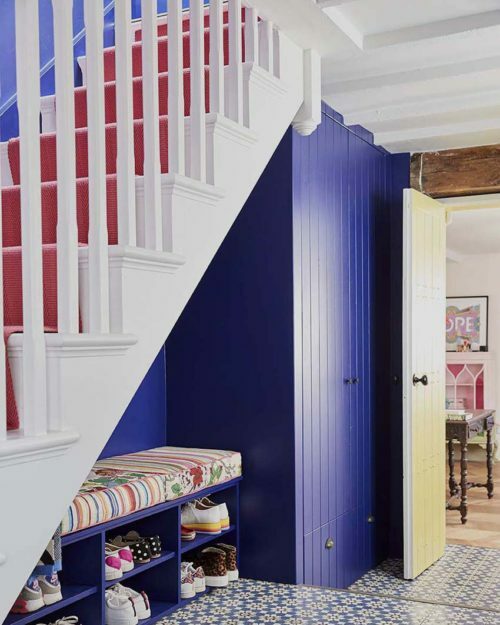 So many people feel overwhelmed by the hallway, especially if it goes up the stairs and onto a landing, and so play it safe and go for a light neutral scheme. I think you need to flip this on the head and realise that no one really hangs out in the hallway for any length of time so you can actually really go for it and make a real style statement. It’s a great feeling to come home to a hallway that says “Yes, you’ve made it!”. You are renowned for your fearless approach to colour. Can you share a few top tips for those looking to add colour to their home but are unsure of how to start? You have to listen to your gut and choose colours that you are drawn to. Not sure where to start? Start by taking a look in your wardrobe or jewellery box. What colours are you collecting and what gemstones do you love to wear. Next you can start keeping a scarp book, just be free and unrestrained and start collecting images, swatches, photos and colour references you enjoy. This research is a vital process to creating your dream home. You have to do the ground work to discover what it is you love in order to make an interior that feels like home. Still stuck? Come on one of my Colour workshops. What is your best flooring tip? Flooring doesn’t not have to be neutral. You wouldn’t hesitate putting colour on your walls, and so too you shouldn’t hesitate putting colour on the floor. 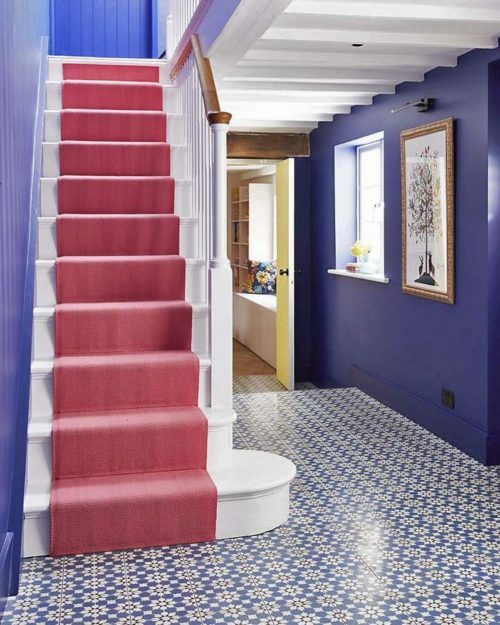 A stair runner is the perfect opportunity. If you are afraid of coloured fitted carpet, go for large scale feature rugs instead. What trends should we expect to see in 2019? 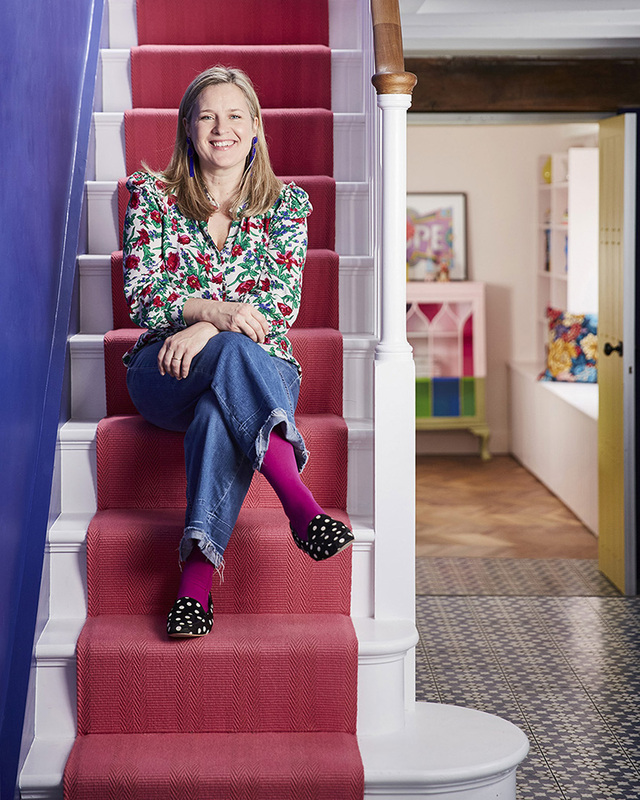 You can see more images of Sophie’s home and hallway over on her instagram page @sophierobinsoninteriors. Tune into her fortnightly podcast The Great Indoors for more interior design advice and read the blog at sophierobinson.co.uk for articles on interior design trends. Let us know if Sophie has convinced you to be bolder with your colour choices over on Instagram, Facebook or Twitter. Images of Sophie’s hallway were were taken by Alun Callender.